I have recently posted on social media my money clip in different settings. Money Clip, like my Pendant, has had coffee with me, has been to restaurants and other places. (Money Clip is always with me, but we just decided to leave a photographic history.) Both Money Clip and Pendant are creative works by Barry Perez. We were in Target the other day and Money Clip was inspired. It wanted more from life than to just hold cash and credit cards. Money Clip wanted to be pretty. I told it that it's always pretty, but it would not be assuaged. 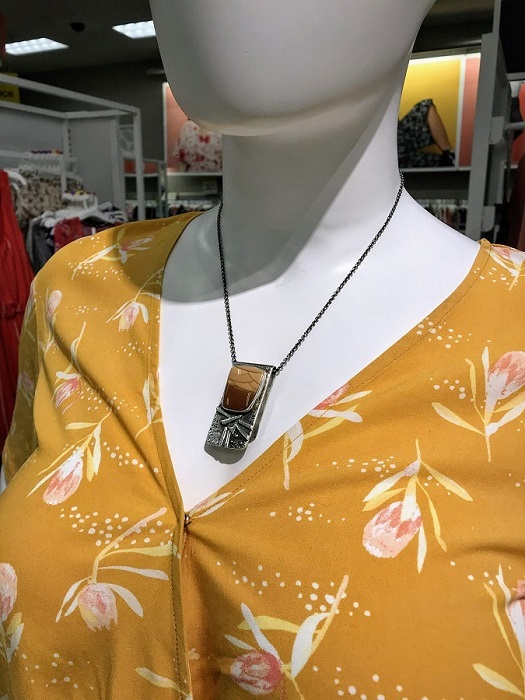 So I took a chain off of another one of my Barry pendants and fed it through Money Clips' opening and asked it which mannequin it wanted to be on. Money Clip chose this one. Sometimes you have to listen to your belongings. I had no idea Money Clip was so beautiful, but it really does stand out nicely here. What are your thoughts?